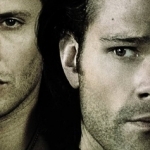 The journey through the Season Ten finale of Supernatural was both intense and perplexing. While there were a few surprises, I was left feeling that there could be more. The promise of next season is that some of my lingering questions will be answered. Until then, we have a long summer to wait through. Per tradition, we got “Carry On My Wayward Son” to start off the episode. I did like that we had the fan version leading into the Kansas version, since they were both vital elements in our fandom’s history. Though it’s always a mixed bag, because when we hear that song we know it will lead off an emotional finale. And this time was no different. First up, we check in on Sam. 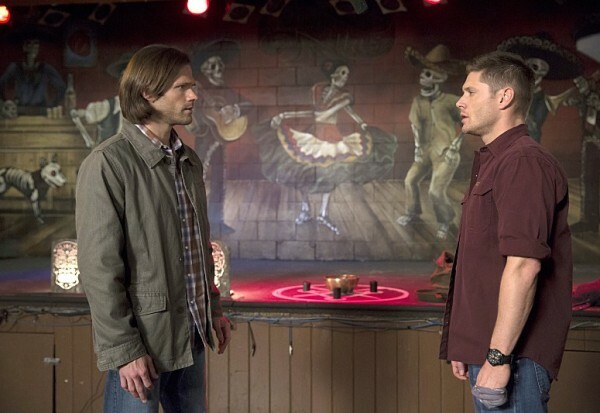 Dean has pretty much split town, but Sam is not going to give up on his brother. He has the broken code that Charlie figured out, he has the family pictures to remind him of why he’s doing all this, and he’s also got the witch-killing-brew-filled bullets to make sure Rowena does what she’s supposed to do. He thinks he’s ready, but is he really? This is a bad situation for all involved. And it’s not like Dean’s doing any better on his own. Since he left Cas beaten to a bloody pulp, he has gotten drunk and apparently forgotten much of his night. We find him waking up, sweaty, and laying on his motel room’s floor, only called to consciousness by the repeated messages Sam has left on his phone. 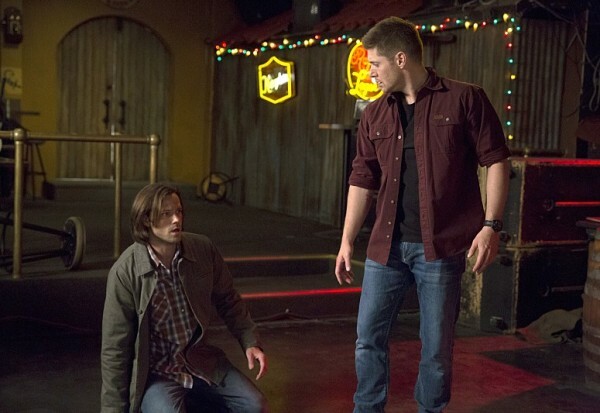 This whole Winchester separation can only lead to very bad things. We see how far the Mark has taken Dean away from who he used to be. He goes to investigate a dead girl, a case that is supposed to be Rudy’s, and makes very uncouth statements about the girl’s appearance and her situation. Not only that, he acted horribly toward Rudy and his uncaring nature eventually led to Rudy’s death. His reactions, however, were a bit uneven to me. At times he was aware of how much he crossed the line and it weighed heavily upon him. Other times, he knew he was doing wrong, but he just didn’t care. And he’s caused quite a few deaths over his time with the Mark. Even though it seemed that way, Rudy was not the tipping point that finally pushed him to the edge. Instead, it was a symptom of the overall problem. Dean knows he’s got no hope left, so he ties up his loose ends and reaches out to the only solution he knows. However, I will say that Sam finding the keys to the Impala and the note of “She’s all yours” was the final nail in it for me. You know Dean’s given up all hope when he gives up Baby. I will get back to the whole Death thing, but first I want to talk about Cas / Crowley / Rowena. You knew the spell wouldn’t be easy, and having it include the forbidden fruit from the Garden of Eden, the Golden Calf, and something Rowena loves? Quite a feat. We find out that Rowena did love one thing in her life, a young boy named Oskar, but that was centuries ago. How could they find him now? Well, that one turned out to be relatively easy, since Rowena blessed him with immortality. And who should be Oskar? The young man from the diner, the one that fandom immediately latched onto last episode. 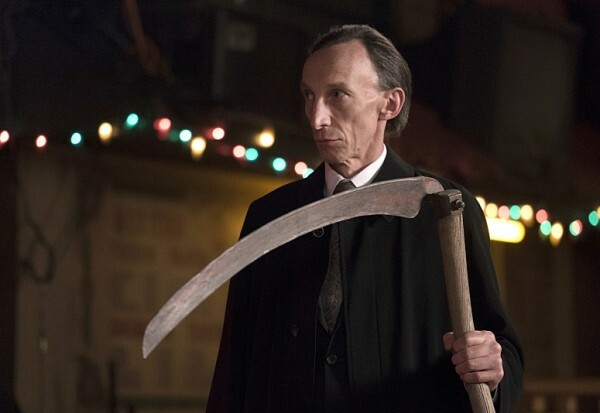 Sad that he was so engaging and then had to die, but such is the way with Supernatural. 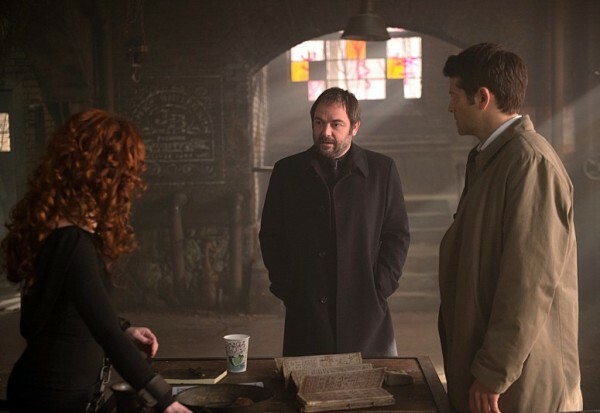 And while I’m relatively happy how the trio turned out, with Rowena escaping and super-powered, and Cas facing off with Crowley, I didn’t think the threat of death was so ever-lasting to make us wonder over the summer. They surely wouldn’t kill Crowley off-screen and just show us the clean-up, right? Especially since we saw him come back into his own the prior episode. So, I felt that was a bit of a wasted opportunity, but at least we have the promise of more Rowena next season. Okay, back to Death. Dean wants Death to kill him, but Death cannot do that. For the reason behind that, we get a longer explanation of how the Mark is a lock and key to hold back the Darkness. Without someone wearing the Mark, the world will be thrown into chaos. I understand that, and it was a repeated mention ever since Cain. Someone has to carry the Mark, so if Dean can’t remove it he must remove himself. But the whole situation with Dean and Sam seems murky at best. 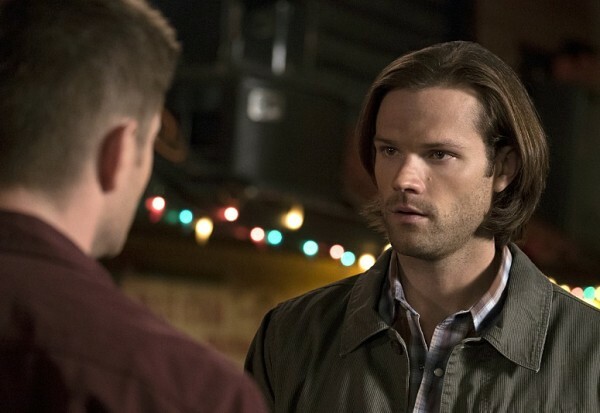 Sam won’t quit fighting to save his brother, so before Dean can be banished Sam must die at Dean’s hand? I mean, I knew Dean would eventually have to kill Sam, since that was the prophecy from Cain, but the reasoning behind it felt weak. The face-off was very tense, and I was unsure if Dean would go through with it. 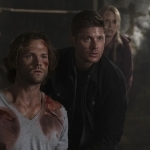 The double-cross and having Dean kill Death was totally unexpected, but then it felt like it was just dropped. Dean killed Death, which seems impossible. And even if he did go through with it, shouldn’t there be some repercussions? Like an apocalyptic event or something? Because the Darkness emerging was because Rowena removed the Mark, not because Dean killed Death. Another lingering plotline that needed more follow-through, along with the Darkness. The black smoke overwhelming Dean and Sam looked quite familiar, like when the demon cloud overtook Dean and Bobby in the car. I’m not sure the vagueness of the Darkness really played through well, but we’ll have to wait and see where they go with it next season. I have hope that it will be interesting.